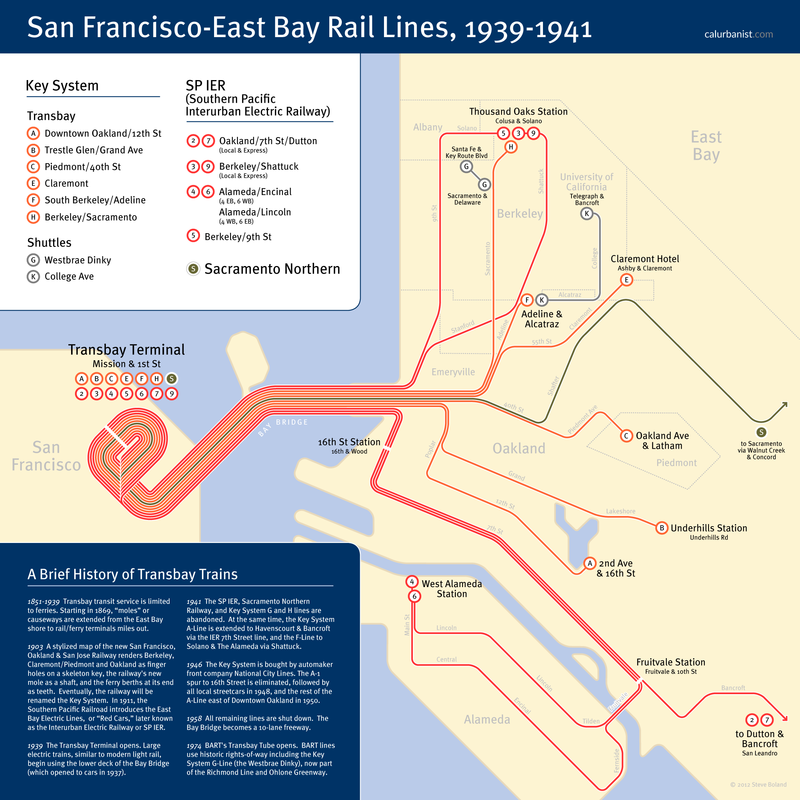 You can find a brief history of San Francisco-East Bay rail service below. This map shows Transbay rail service at its peak, just after the Bay Bridge opened, when passengers could cross the Bay without transferring to ferries and before the ability to drive across the Bay did to demand for rail what trains on the bridge did to ferries. It may be hard to believe now, but cars were once confined to the upper deck of the Bay Bridge, where there were three lanes each way; below were three lanes for trucks and two pairs of tracks. In the East Bay, the tracks split up as shown below, fanning out into Oakland, Berkeley and surrounding cities and offering much greater coverage, if not reach, than BART does today (several of AC Transit’s Transbay bus routes are direct descendants of Key System lines). On the city side, connected to the bridge by a viaduct, was the Transbay Terminal, which later became a bus terminal and which has since been replaced by a modern transit center that, one hopes, will someday become a train station. This map imagines what a modern schematic diagram of the system might look like, had it survived. The font is Eric Spiekermann’s FF Meta, which has been described as the “Helvetica of the ’90s,” but which to my eye, at least, has a more vintage vibe.